THE NEWSPAPER IN MY COMMUNITY runs a mystery photo every Saturday. Readers are invited to identity and name the location of the place in the image. If correct, their names will be entered in a drawing for $100 in Faribault Chamber bucks at the end of the year. I’ve participated only once. I’m just not that interested in challenging my brain to identify some place in town. But maybe you like brain teasers. So I’m challenging you to name the items in the two photos that follow. These are both at my home and are two of four items/appliances which broke within 10 days. Whoever said things happen in threes was wrong. PHOTO A: Why don’t they build these like they once did? This is the third one we have installed since moving into our home in 1984. The one in my mom’s house was original to the 1950s rambler and was still working in 2014. PHOTO B: This object may or may not be familiar to you, depending on your sense of humor. Identify these objects and you will know what we had to replace in addition to a microwave and a dehumidifier. Try not to cheat and peek at the answers. If I knew how to turn this print upside down, I would. Photo A shows the top of our leaky gas water heater. I entered the laundry room on a recent morning to find water spreading across the floor. I phoned the husband at work. It was only 7:15. What a lovely way to start his day. Upon his arrival home much later and after supper, we headed to the local hardware store which had exactly two gas water heaters and no one on staff who knew anything about them. Randy surmised we needed the taller one. I disagreed and suggested we return home to measure. Nope. So the taller version was loaded into our van and unloaded onto the driveway. Guess what? I was right. Eventually, with the correct size purchased, it was then time to wrestle the old water heater out of the basement and the new one into the basement. No one was injured in the process. At 8:40 p.m., the husband announced that the old pipes were not long enough as the new model differed slightly from the old. The hardware store was closed by then. Because my husband desired a hot shower after a hard day of work, we then drove to a Big Box retailer in a neighboring town for those pipes. By 11:30 p.m., he had hot water and a shower. 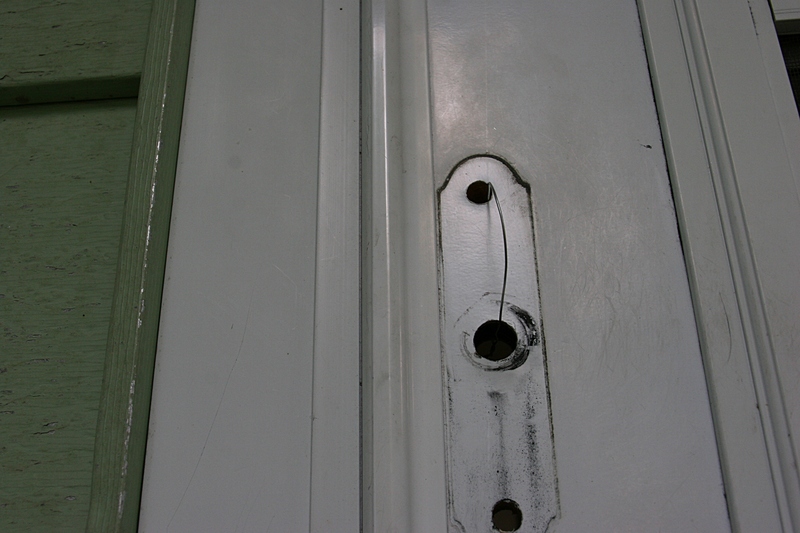 Photo B is an improvised door handle to replace the one that fell off in my hand one morning, leaving me locked outside. Fortunately, my son was home to let me back inside. Then, what to do. I called the husband. Again. Are you seeing a pattern here? Hey, I am not mechanically inclined or good at solving problems like this. He advised that I find a screw driver and remove the broken handle and slip wire through the holes where the handle was once secured. I did. But apparently I do not know how to twist wire as the wire broke loose, leaving me once again stranded on the back steps. The son let me back inside and retwisted the wire. It held. For the past week we have been using this wire handle, appropriately dubbed (by the husband) as a Redneck Door Handle. There, how did you do? Did you guess hot water heater and Redneck Door Handle? If so, award yourself an “A” and then explain to me why nothing lasts anymore. Congrats on identifying both. I just can’t believe so many things broke at about the same time. What are the odds? Built-in obsolescence is necessary for the job security of our ever burgeoning population, don’tcha know, ya shore, you betcha! Seriously, though, I’m with ya on that whole short lifetime thing we all experience. Water heaters, microwaves, blenders, coffeepots (yikes! did I “jinx” mine? ), computers (yikes! again!!!! )…..all things, and so many more, that we just canNOT live without——but wait!!! For all those years we DID!!!!!! Sigh…… Sorry, no answers from this gal!!!! Only hugs…………………. I knew a lot of readers would relate to this post. I picked up on the hot water heater. I have replaced enough of them (sigh). As for the Redneck Door Handle, it sounds like a scene that plays on a loop in our household. Country Girl Wife: That’s so redneck, fix it. City Boy Me: Did you just say what I did was redneck? City Boy Me: [blush] Gosh thanks. Oh my; I can relate. I think this can all be tied in one shape or form to efficiency. Back in the day, no one paid much attention to how much pollution a process created, or the materials that went into a product. Things were built to last. These days, it has to made faster and/or lighter with as green a process as possible. I think all of that lends itself to poorer quality. I am all for green, but it needs to make sense. If the green process needs to be repeated 5 times in a 20 year span when the less green process only needed to be done 1 time in 20 years…this is the math (impact) that isn’t always considered perhaps. Who knows, just a thought; I could be way off base. Sorry for your troubles. Very frustrating. Now yours is an idea that seems plausible. Of course this is a wide open subject – but first- ya gotta understand that men will generally think it’s bigger than it actually is. Water heaters: within the past two years I had an Asian girl search hard on the internet and spend 200 bucks more for her new water heater- hmmh.. Fairly easy to install – about two hours – hmmh, (i said) hmmh. BTW. she’s a trusted friend. No internet searches for this girl. Humm, build in obsolescence thus better job security equals stronger economy. In theory! Ha ha I thought that was a hot water heater and you are right nothing lasts like it used to. Well, I feel lucky now. We only had one appliance poop out on us this week…but a big one. Our refrigerator died and we have been without one for a week. It is supposed to be delivered tomorrow. It is amazing to me how expensive they are. And yet the lifespan is only about 10 years. I don’t ever remember my parents having to buy a refrigerator, and this is the second one we’ve had to purchase since we’ve lived in this house. Why don’t they make them like they used to? I think it is because planned obsolescence makes the companies a lot of money. Your final sentence seems pretty darned logical to me. Sorry to hear your fridge went out. I think a few bunnies may be living under my fridge. Ever notice how an avocado, dark brown, golden harvest etc. colored appliance will last forever even when you wish it would quit? Oh, now I am laughing. Sorry to hear you’re dealing with the same number of failures as us. Frustrating, isn’t it? I guessed them both correctly as well. I think you are well over your limit of breaking items in your house now so maybe you can rest easy. Fingers crossed.